Household items are useful for places other than the house. These 12 things you'll find in your kitchen can help keep your barn clean and your horses happy. Add some baby powder to your horses' legs before they make their way to the show ring. Baby powder prevents dirt and helps keep their legs clean. Horses seem to have a fondness for mud. You can bring your horses' beautiful white socks and stockings back to their glory with baking soda. 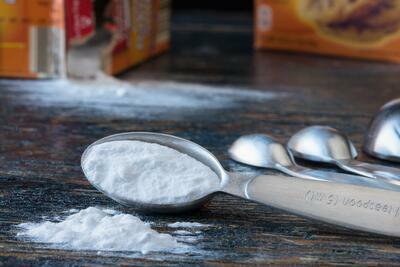 Combine baking soda with a little bit of water, scrub it on your horse's feet to remove dirt buildup. If you're like most horse owners, you're probably tired of losing headstall screws. Fortunately, nail polish can keep them in place. Coat the screws with clear nail polish before screwing them in the tack. Running low on time and need to clean up your horse? Try some moist towelettes. These wipes are safe to use on horse muzzles, ears and faces. Use electrical tape as a wrap to secure horse leg wraps. Electrical tape can even be used to wrap bucket handles and additional items so tails and manes don't become tangled. Dawn dish soap will help return horse markings to a beautiful white hue. It also cleans up saddles and help combat topical fungus as well. A toothbrush will clean your conchos, tooled leather and silver buckles quite nicely. Opt for soft bristles so you don't scratch the leather. Baby oil is perfect to tame horse hair. Add it to your horse's face and he'll look his best. Zip ties repair everything from corrals to bucket handles, tack and beyond. They're the perfect temporary fix when you're short on time and supplies. Does your horse like to gnaw on things you'd rather he not? Sprinkle red pepper flakes onto these items to prevent chewing. If your horse has a leg injury and you don't have many medical supplies, cut the toe portion off a tube sock, slide it on your horse's leg and it will hold bandaging in place. Rubber gloves ameliorate tack cleaning, medical tasks and so any more horse and barn-related projects. We have just about everything you could possibly need for horse and arena care. We invite you to take a look at the our arena drag equipment, watering equipment and replacement parts. Give us a call at 866-362-9353 and we'll help you select the optimal equipment for your horse and arena care needs.